This goes for anyone with an Instagram account, personal or business, make sure your feed is quality. Instagram is for photos. Your photos should be interesting, aesthetically pleasing, and high quality (as good as they can be for a camera phone). In addition to the above qualities and more specific to marketing a business on Instagram, your photos should be relevant, reinforce your brand, and entice followers/shares. It’s important to keep your purpose for posting in mind. 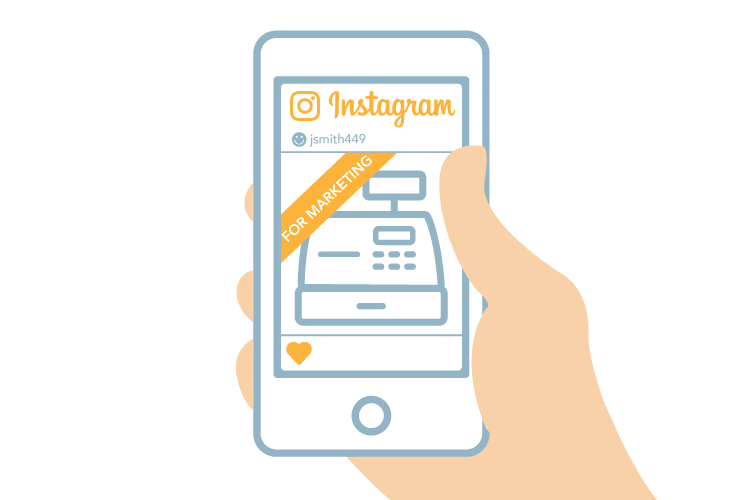 This article is about improving your business by marketing on Instagram —remember that. If you have a personal Instagram account, hold on to your personal photos and publish them through that account. Your personal Instagram has a different purpose and a different audience, they expect to see pictures of your kids or what you ate for dinner. It’s great to express yourself on Instagram, give your audience a glimpse of your human side, but if you’re operating under the name of your business, keep it focused and your posts specific to promoting your services. This doesn’t mean you can’t connect with your customers on a more personal level, just that there’s a more appropriate way to go about it. For example, if you post a photo of one of your products, add a little detail to the description. “This bracelet was engraved by hand, like all jewelry from the John Smith collection.” OK. Maybe you don’t hand-make your products or your services aren’t tangible. You can still put something out there that lets your audience know you care about the craft and quality of everything you produce. Try using a customized link shortener to track traffic. It’s important when marketing to know how well your Instagram account is driving traffic and leads back to your website. Unfortunately, Google Analytics can’t accurately track this traffic when users visit your website from your mobile Instagram account. To monitor accurate click rates, use a customized bit.ly link (or a link from another shortener) exclusively for the URL in your Instagram bio. Then you can check your bit.ly data to document how many clicks your Instagram account is actually sending to your website. Create a different bit.ly link each time you change the link for a new landing page, campaign or default page to continuously track successful traffic leads. Hashtags have come a long way since the start of Instagram. Today, hashtags are way more vital to networking and making relevant connections on Instagram. The “Explore” feature available on Instagram allows users to view posts or related posts that are trending for a specific hashtag. So, if you’re marketing yourself on Instagram and you’re in the food business, check out some relevant hashtags to find what’s popular, check out your competition, or build your follower base by networking with other “foodies” on Instagram. Cross promoting and sponsoring posts can be a great way to acquire more followers, but you’ll need to establish relationships with these users to get your name out there. Another reason why your content and photos must be AWESOME. Like any form of social media, be aware of over-saturating your account by posting too often or posting unlikable content. Although you should be consistently and frequently posting to make yourself visible, recognized, and credible, there is such a thing as posting too much. Don’t post just to post. If you haven’t published anything in a while and you’re scrounging for a photo just to put something out there, chances are that photo is not worthy. Over-saturating is a surefire way to cut down your follower base. If your continually posting lousy photos, you’re probably annoying your followers – and unless they really like you, it’s just the click of a button to make your stuff disappear from their feed. To avoid over saturating your feed, utilize your MARKETING CALENDAR. Make it a point to remind yourself that you need at least 3-4 quality photos a week and post them in a timely manner throughout the week. Of course, if something comes up on the spot and you have a great photo to share, share it. But make sure your tracking your posts to be sure you’re not posting too much, or too little. You want your followers anticipating your next photo. Don’t let your posts lose their zing — you want to keep your audience coming back for more, making it a point to not scroll right over your photo in their feed. If you can, try throwing a cool video in the mix to shake things up, if you have something worth filming. Over-saturating is a sure fire way to cut down your follower base. If your continually posting lousy photos, you're probably annoying your followers. Direct users to your most valuable content. While Instagram now allows advertisers the ability to add clickable links in their carousel posts, URLs still aren’t clickable in photo descriptions. Fortunately, you can get around this by utilizing the link section of your Instagram account’s bio. You can choose to direct users to a permanent page, such as a blog or your website, but an even better option is to link to your most current content, whether that’s an article, blog post or promotion. There are a ton of other features available on Instagram that you can use to market your business, like partnering with influencers, using sponsored posts, and cross-promoting. We’ve covered some of the important basics of getting started with Instagram to build your brand. Like anything new, it takes practice and attention to detail for you to learn what works and what doesn’t work for promoting your business. Do a little research, keep track of what posts get the most likes, and network yourself. Instagram can be an incredibly beneficial way to market yourself, as long as it’s done the right way.